If you had trouble updating your iOS devices to iOS 5 yesterday, you’re definitely not the only one. There were many reports of all kinds of errors happening during the update. A lucky few got the update without a problem. But if you were like me, updating to iOS 5 was a frustrating experience. I wanted to share with you my own experience. Like a good geekling, I spent the night before making backups of my two iOS devices — the iPhone 4 and iPad 2. It’s always a good idea in case things go wrong. I wasn’t anticipating anything going wrong though. It shouldn’t take me more than an hour or two to update right? I was also hoping iOS 5 would be available for download by the time I finished backing up, but that wasn’t the case. I woke up the next morning, all excited and ready for the new update. I plugged in my iPhone and hit the “update” button in iTunes. So it downloads the new iOS, then starts extracting and installing it on the phone. But then I got the horrible error message. I assumed I was running low of space, so I removed some apps and tried again. I later learned from my friend, Ryan Ozawa, that the error was due to Apple’s servers being overwhelmed and not validating before initiating updates. It kept on trying to install and it would run for a while and then error out at the same spot. I continually tried again and again for next few hours. Note, I started this process at 10 AM PDT. One time, the installation got a litte bit farther, but errored again and my phone restarted itself. On the screen was an image of a plug and the iTunes icon. I removed the plug and put it back on. 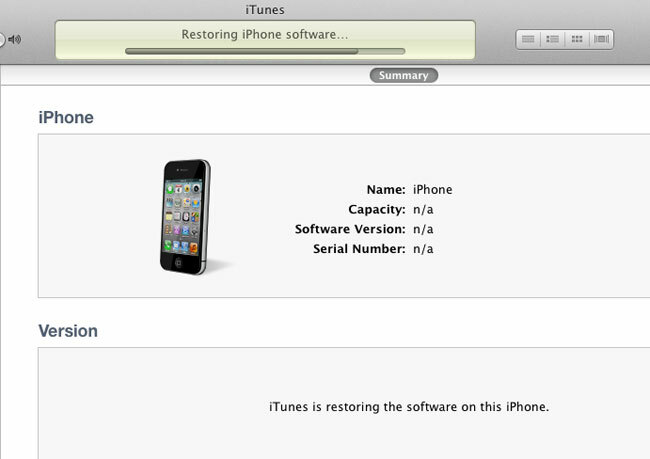 iTunes noticed that the phone was in restore and recovery mode. So all my data on the phone is gone, there’s no phone number, no working OS, nothing. So my only choice now is to just keep trying to recover and update phone. I must have clicked the same buttons for a few hours, and getting frustrated every time. Several hours passed and I thought the whole thing was really hilarious because I just wasn’t getting anywhere. Finally around 4pm PDT, it was able to verify my phone with the Apple servers, and the installation continued. The restore from backup part only took about an hour. Finally by 5pm, I had a working phone running iOS 5.0. I was a bit hesitant, but I decided to update my iPad too. I got similar errors a few times, but kept trying. It finally went through, and backing up my pages of apps took a while. That only took me about 4-5 hours. Much better than the 7 hours for my iPhone. Overall, it wasn’t exactly a fun experience. The iOS 5 download was over 700 megs. Installing it required validation from Apple’s servers, which were bogged down due to many people trying to do the same thing. If you got through, you either had great timing or were just lucky. Getting your device verified could take anywhere between a few minutes to hours. And then backing up and restoring your data back on the device could take up to an hour, depending on how many apps and documents you had on the device. So, was it worth it? I have to say yes. The new notification system looks and feels wonderful. Never miss another notification message again. You can now sync your data across devices using the new iCloud service and read beautiful magazines with their new Newsstand app. Safari now has tabs! The operating system also feels much faster too. The new multi-touch gestures on the iPad makes jumping to and from apps much easier as well. The split keyboard for the iPad makes it easy to type when you’re holding it with both hands. The list goes on and on. For a great overview of the new features in iOS 5, check out the post by Gord McLeod. Daynah is a geekette who enjoys web development, coding in PHP, digital photography, crafting, and tinkering with gadgets. She's currently a Senior Editor at Beatweek Magazine as well as a Tech Blogger at GeekBeat.TV and Daynah.com. Find out more on Daynah's Google Profile.